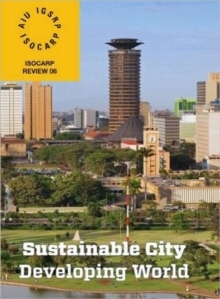 Sustainable City/Developing World (ISOCARP Review 06) addresses the challenges posed by climate change for the cities and urban regions of the developing world. It is about the responses that are likely to be most relevant to the cities in the poorer countries, on the one hand, and to those of the fast industrialising countries on the other. How can planners, designers and other decision makers best secure development that is more resilient to the extreme conditions increasingly associated with climate change? And what techniques can they employ to ensure that the cities of tomorrow are developed along low carbon principles? These questions and others are addressed in eleven rich case studies drawn from around the world. Sustainable City/Developing World starts with three studies from Africa, including an important overview from UN HABITAT. Next comes a second, global overview, provided by Jean-Pascal van Ypersele, Vice Chair of the Intergovernmental Panel on Climate Change; this provides five concise messages on the need for urgent action. Other papers in the book cover the planning of Chinese cities, and Abu Dhabi which is becoming an important world laboratory for low carbon planning and design. The final section of Review 06 introduces some new methods and strategies. These address the challenge of measuring a city's carbon footprint (based upon Leicester in the English Midlands), post disaster planning in the wake of Hurricane Katrina, the use in Syria of satellite imagery to measure losses in urban green space, and the scope for an intensification of urban food growing as a new priority for planning. This beautifully illustrated book will be important reading for anyone seeking to learn more about international planning and design approaches in this era of climate change.